I thought I would let you know about the board now that I have had it for a few weeks. I absolutley love the Hooked. I can not tell you how much but will try. Remember, I am 6’3″ and 230 lbs. This is the 4th board in our home and it is by far and away the most stable, not even close. First thing I will say, I am surprised how soft the deck pad is. I was a little concerned with that but very soft and comfy. Bomber too. 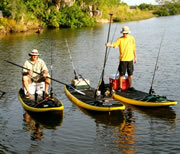 I use the board to fish and just paddle around on. I load it up for a day on the water. I get into side chop and never do I feel unstable. I am amazed by this considering how big I am and how big the chop was. My other board could float me and get me through but this board blows it away with its stability. I am completely blown away by how fast it is for a big board. It is faster or just as fast as the other boards in our home. Very easy to paddle. I fly fish off of it. I have caught an 18 lb carp with my fly rod from it. No problems what so ever for casting as big as I am. I can walk on the board, turn around and have even stood my big clumsy self on one foot just to see if I could. I also troll with my spinning set up. I highly recommend this board for anyone big or anyone needing a board for expedition trips. With our short season here in the high country this board will extend my season by weeks on both ends. It is a much drier ride and the “fear” of falling in the cold water is gone. Anyone second guessing the size of this board and it’s “nimbleness” of this board please have them get ahold of me. I can not recommend this board enough. It is durable and a really nice looking board too. Alex, my video editing and taking is just coming along but I have some video of my fly casting and will edit and put that together for you. I am absolutley Hooked on fly fishing for giant carp now on the board. Thanks for a great board. 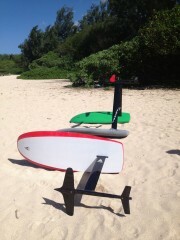 John Denney posted in Hooked SUP the fishing Standup Surfboard. Talked to you back in September ’10 when Robin from Urban Surf got his first hooked up board. I bought it and never looked back. Put on over 600 miles paddling this winter. Been doing over night tours in Puget Sound. Got my deck equipment dialed in, with dry bags and fish rods. Been helping Robin promote your board every where ever I go. Interest is growing. Last week talked to Doc. about my plans to do an extended tour, possibly to SE Alaska in a month or so. Wondering whether you would want pictures or story or ? I’m passionate about your hooked up board and design. Is there anything I can do to get be involved in promoting your board? Board works great. I’ll take an additional one when you get your next shipment. Please let me know when they come in. Man that board is great… Can’t believe how much I can move around. It just sits in the rail with such stability. Packaging was good and it arrived with no damage. Thanks for putting out such a great product.